Feb 5, 2019: The Isuzu D-Max V-Cross is the more urban and modern version of the D-Max and is often picked up by private owners as well. However, despite having a similar D+4 setup, it is lighter and has more features than the standard model. To start with, the cabin has a slew of features like air-conditioning, cruise control, a navigation system, driver information display and an adjustable seat. It even has ABS for its hydraulic brakes while the suspension is done over double wishbone coil springs and leaf springs for the front and rear respectively. It has the same 2.5-litre engine under the hood that generated 78 bhp of power at 3,800 rpm and 176 Nm of torque at just 1,800 rpm. A 5-speed gearbox does the transmission duties. Isuzu is one of the fastest growing personal and commercial vehicle makers in India. This Japan based automaker, famous for manufacturing engines and commercial vehicles, realizing the potential in Indian commercial vehicles market had launched the Isuzu D-Max V-Cross pickup truck in the country. D-Max V-cross from Isuzu comes powered by a 2499 cc Common Rail, VGS Turbo Intercooled Diesel engine. This engine works on a 4 cylinders model and complies with BS-III emission norms. It is capable of producing a maximum power of 78 bhp at 3,800 rpm and maximum torque figures of 176 Nm at 1800 - 2400 rpm. Isuzu D-Max V-cross comes mated to a five speed manual gearbox. This pickup truck, in terms of performance does not lag in power generation. The maximum 78 bhp figures are good, if not best in the category. It accelerates in a smooth manner and works on the tall gearing method. Maximum torque of 176 Nm at 1800 - 2400 rpm helps the V-Cross in sticky conditions. The 4X4 drive is great, especially when compared to other pickups available in India for buying. However, we do not feel that D-Max V-Cross is that big transitional pickup truck Indian consumers are looking for. 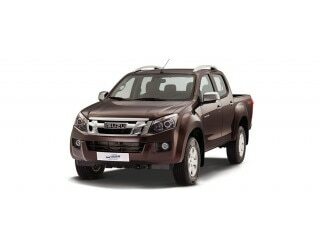 Isuzu D-Max V-cross pickup truck is built on the standards set in Japan. The Tokyo based commercial vehicle maker has really done a splendid job in terms of its build quality. It looks a notch above, even the paints used on the body appear extra smooth. We are sure the Isuzu D-Max V-cross pickup truck will last even after a lot of off road adventures. As we said, it is a Japanese brand, after all.The deck can only hold a maximum of 265 kg weight. This part has scope for significant improvement, especially because we Indians love to use our vehicles in every way possible. This 265 kg weight capacity may just be a turnoff for the Indian consumer. The incorporated power steering is a master-stroke especially given the size of the pickup. We mean, consider the 3095mm wheelbase this pickup is offered in and yet it feels butter smooth to control and manoeuvre. We tested the vehicle on busy city roads, highways and on no roads as well. The steering never lost hope in us or shall we say we never lost hope in the power steering inside D-Max V-cross. It was a lot of fun driving and testing the vehicle. The suspension part is excellent as well. All the pits, from smallest to the biggest we faced were absorbed beautifully by the pickup truck. It ensured a comfortable drive on all the roads it was tested on. But, yes there is a catch, and that is we did not feel that comfortable while driving it off-road. The bumps were easily felt and it did cause pain in the back. Braking and safety are the most important factors in a vehicle for us. It’s simple, if a vehicle can reach 0-100 in 10 seconds time but can't reach 100 to 0 in lesser time, than it’s of no use. And for the record we fell in love with the braking abilities of Isuzu D-Max V-Cross. The pickup comes loaded with ABS, which definitely is a game changer. The brakes on the other hand, are exactly what the pickup needs! This pickup truck is indeed a complete package in terms of braking and safety. The first thing we noticed in the Isuzu D-Max V-Cross is the amount of muscles on the exterior body. It at first, appeared as an all American muscle pickup, but soon we were back to thinking that the pickup has been developed in Japan. Designed like a beast, boy wouldn't this truck grab a lot of attention? It sure would. The headlamps are classy and so are the rear view mirrors. Overall the design is not a hastened one. It's carved with patience and off course elegance. And as we said earlier the ride quality is comfortable on city roads however lacks the punch while off-roading.